When it comes to the world of serious homebrewing, Blichmann is considered the name to beat for a very good reason. Not only are their products backed by almost two decades of solid experience, know-how, research, and performance, but they are also the choice of dedicated home beer makers everywhere because of the way they outperform the competition. 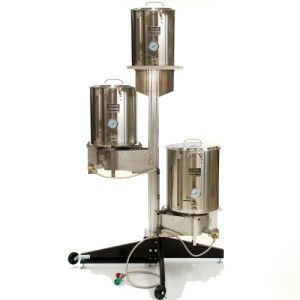 Now you can truly take your brewing to the next level with a 3 tier brewing system that includes top-notch Blichmann brewing equipment. When it comes to all grain brewing systems, it’s every homebrewer’s dream to be able to construct a home brewery from the ground up, a brewery built specifically to meet their unique set of needs. Now that dream is a reality. When you’re in the driver’s seat, your 3 tier brewing system can be whatever you want it to be. The following are just a few of the possibilities that await you. Select the size of your brewing vessels to correspond with the batch sizes you typically produce. Choose from a wide selection ranging from 10 gallon stainless steel wonders all the way to heavy-duty, king-sized, 55-gallon BoilerMakers. Go all electric when you elect to add a shelf tier to the Blichmann top tier. Easily accommodate your mash tun, brewpot, and HLT. Alternatively, you can combine electric with gas by adding a burner tier as well as a shelf tier. Whatever you prefer, it’s doable! Take things even further when you add features like Ranco controllers, plate chillers, a heat exchanger, a March pump, and many, many more incredible options that will send the quality of your brews into the stratosphere.